Every year our city likes to kick off Summer with an outdoor concert series! Every week my family and I look forward to attending "concerts in the park". We've been doing this for several years now, and it just gets better every time! You pack a picnic dinner, your favorite beverages, chairs & blankets, and your dancing shoes! While attending a concert in the park, you can plan on spending a few hours with fun people, delicious food, and great tunes. I try to keep our dinner menu as easy as possible when heading to the park. And because the evenings are still warm, eating light is always a nice option. How do I pack the perfect picnic? 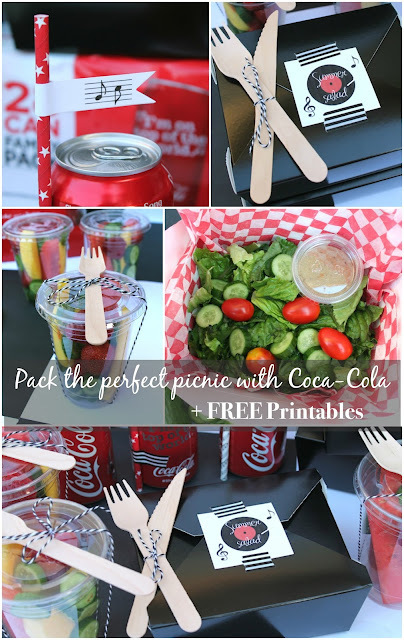 Disposable food containers, fresh fruit, a summer salad, and refreshing Coca-Cola! 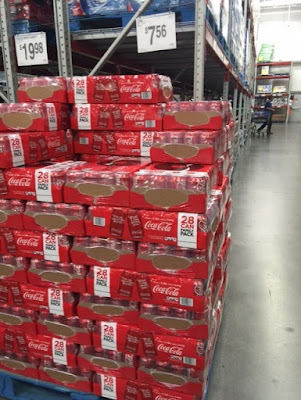 You can even click here for a convenient way to purchase your own 28 pack of Coca-Cola! The time had come for me to start prepping for our picnic dinner! First I started preparing the fruit cups. They're super simple to make, and are the perfect treat to enjoy anywhere. The plastic cups & lids make them really easy to travel with. I set out watermelon, strawberries, mini cucumbers, and mango. Mmmm! First, I cut off the ends of the longer watermelon spears, so they would fit in the cups. Then, I diced up the mini cucumbers and started layering the fruit inside the cups. Once the cups were filled, I attached the lid securely, and tied a bamboo fork on top. So easy! Next, it was time to build the salad! My supplies included some disposable food boxes, basket liners, printable tags that I created, and washi tape. I used a package of salad mix, tomatoes, and mini cucumbers. I lined my box with paper basket liners, and started building our salads. I filled the box with lettuce, added tomatoes, and cucumbers. Just think of all the fun toppings you can add! Once the food boxes were filled, I poured small amounts of salad dressing into mini cups, and set it inside of the salad boxes. I closed up the boxes, and topped them with my little music themed tags. 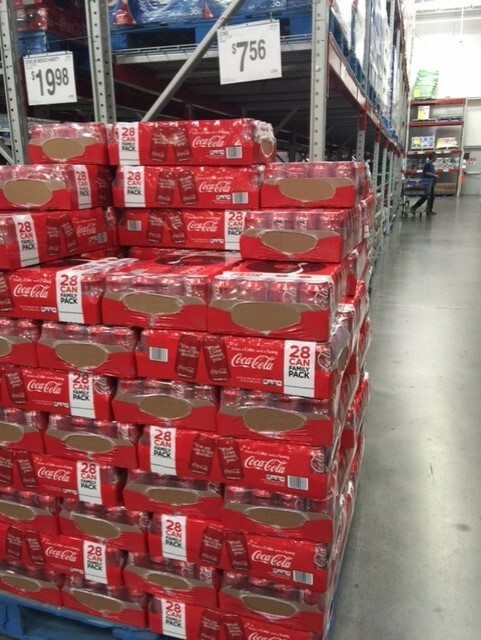 Coca-cola is taking center stage as our beverage of choice. The Share a Coke and a Song Coca-Cola campaign has been in full swing, and their cans make them perfectly dressed for a night of musical enjoyment! I added some fun paper straws to the cans, and packed them up for our picnic. It was so fun packing up for our picnic, and we had the best time listening to music in the park! Not to mention, the clean-up was so simple this time around! And when the band started to play, "I'm proud to be an American", let's just say that was the icing on top of a perfect evening out with friends and family! Will you be packing up for a picnic or road trip soon? You can print out our FREE printable tags and straw flags, here. Use this pin for picnic and road trip inspiration! Thank you so much for stopping by, Nicole! We have so much fun! The perfect picnic dinner!! The printables are so cute!!! Thank you, Blanca! Food seems to taste better when it's packaged up in a fun way.